Flaky crust on the outside, soft on the inside, this Italian bread is everything you want homemade bread to be and more. In a large bowl or bowl of a stand mixer, combine yeast, sugar and warm water. Let stand 5 minutes until yeast is foamy. Add 2 cups flour, olive oil and salt. Stir with a wooden spoon or with a dough hook on low speed until a shaggy dough forms. Turn dough out onto a lightly floured surface and knead by hand 10 minutes, adding just enough of the remaining flour until a soft, smooth and elastic dough forms; OR, increase dough hook speed to medium and knead dough in stand mixer 5 minutes, adding just enough of the remaining flour until a soft, smooth and elastic dough forms. Shape dough into a ball; place in an oiled bowl and turn to coat. Cover bowl with plastic wrap and let dough rise 1 hour until doubled. Heat oven to 400°F. Line a baking sheet with a silicone mat or lightly grease the surface with oil or cooking spray. On a lightly floured surface, punch down dough, then carefully shape into a batard/torpedo about 12 inches long. Transfer to prepared baking sheet. Cover with a tea towel and let rise another 20 minutes until puffy. Use a serrated knife to make a few ¼-inch deep slits in the surface of the loaf. Bake loaf for 20 minutes or until golden brown. Cool completely on a cooling rack before slicing. Great bread recipe! It was so easy and quick and came out delicious. I gave it an egg was and sprinkled some everything bagel seasoning on top before baking. It went great with the pasta fagioli for dinner. I tried to enter yo win the new holiday bread cookbook, but could not enter for soon reason. I would love to win one. I was just wondering if anyone would know what kind of spices to add to this wonderful bread recipe? I worked a couple years at an elementary school many many years ago and, they had a recipe for Italian Bread that smelled so good baking that all the teachers came running to eat it before it could be served to the children. It had to sit overnight and had lots of spices in it, but I can’t for the life of me remember the recipe. I have baked bread the “manual” way and with two different bread machines over a 45-year period; this is the first time I wanted to post a review. I tried this recipe last night using exact measurements in a bread machine set on French bread, Medium crust color for a 1-1\2 pound loaf. I even set it to bake overnight and woke up to the most wonderful aroma! The loaf looked great and rose perfectly. Great crust, soft inside. Best-tasting Italian bread I ever made! And it’s simple and quick. 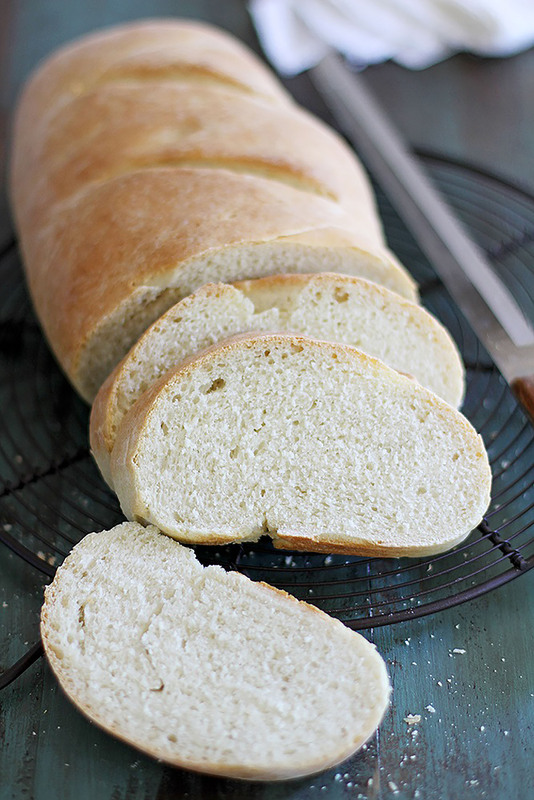 I’m an avid bread baker and this is always my go-to recipe for Italian bread. I double the recipe, put it in my bread machine on dough cycle, then take out to finish loaves, Absolutely delicious!!!!! 2 loaves ready to eat in just a short time!!!! My dough is rising now! I can’t wait to have it with dinner tonight! This recipe is a keeper. So easy, low on sugar and tastes great. Thanks for a great recipe. You have no idea how many times I’ve been disappointed with Italian bread recipes. This one finally, finally nailed it. Just made it once and it was delicious. One thing I did that wasn’t in the recipe was give it an egg white wash, and add some sesame seeds. When I make it this weekend (with your yeast!) I am going to give it a spray of water right before going into the oven- I like the soft crust but I want to see if I can get it a little crunchier. when your loaf is finished baking just remove it from the pan and place directly on your oven rack. Turn off your oven and crack the door open with a tea towel and let it cool. This will give you that nice “crusty” loaf. Store it in a paper bag to prevent it from softening the crust. Can you use quick rise instant yeast instead of active yeast? Yes, substitute on a 1:1 basis, following directions as written. The Quick Rise Yeast may rise faster, so just keep an eye on your dough. One of the most delicious breads I’ve made. Soft, with wonderful delicate taste. Love this recipe. First time I followed the recipe exactly as written and it came out almost perfectly. I baked it for 20 min. At 400 degrees and it could have gone about 3 to 5 min longer. The second time I made it I reduced the white flour by 1/2 cup and used spelt flour instead. Also replaced the sugar with about 2 Tbsp honey, plus a scoop of “super seed” and a Tbsp of vital wheat gluten and came out even better! I also baked it for 2 min longer but still needs to go another 3 or 4 min. Love, Love, Love this recipe! Next time who knows what I’ll add..maybe sunflower and pumpkin seeds or dried onion and dill. The sky the limit! I made this to go with dinner tonight. I’ve never made more than my mothers yeast rolls in regards to bread. This was very simple to make & came out so yummy. Definitely want to try this again maybe with some flavored olive oil or add some seasonings to it just for a change.